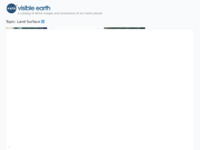 This website is part of Visible Earth, which is hosted by the National Aeronautics and Space Administration (NASA), and contains a searchable directory of images, visualizations, and animations of the Earth. This section contains images pertaining to surface processes, including erosion, sedimentation, land temperature, land use, soils, topography, and more. Each image is available in a variety of resolutions and sizes, with a brief description, credit, date, and the satellite that took the image.